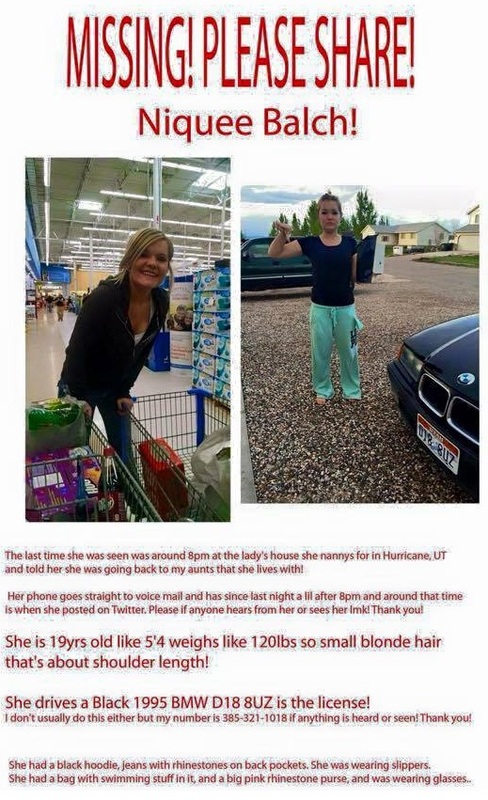 SOUTHERN UTAH – A 19-year-old Hurricane woman who was reported missing Sunday may now be facing charges for filing a false kidnapping report. Police officers were notified of an alleged kidnapping Monday that may have occurred within the Cedar City jurisdiction, the Cedar City Police Department said in a press statement issued Tuesday afternoon. After the alleged victim, Dominique Balch, was reported missing to the Enoch City Police Department on Sunday, the case generated considerable interest as a “missing persons” flyer was posted on social media websites. Balch’s family expressed deep concern for Balch’s well-being Sunday when no one had seen or heard from her after she left a Hurricane home where she works as a nanny around 8 p.m. Saturday. Balch had reportedly told the woman for whom she works for that she was heading home to her aunt’s house in Hurricane. However, her family didn’t see or hear from her and her phone was going straight to voicemail. I have been trying to remain calm, and not see the worst in this situation, but a mother can only not worry for so long. Balch then showed up in Blanding Sunday evening, claiming she had been kidnapped at gunpoint and taken to Blanding, the Cedar City Police Department said in the statement. It is important to note that there is no suspect at large for kidnapping and no public safety risk from this case, the statement said. The Police Department said it will have the case reviewed by the appropriate jurisdiction for charges against Balch for filing a false police report.